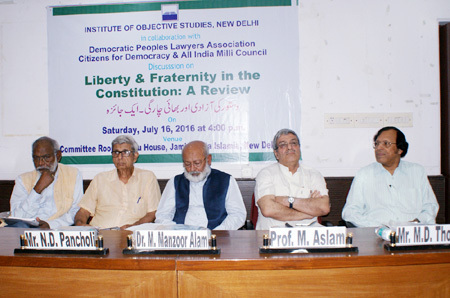 The Institute of Objective Studies organised a discussion on “Liberty and Fraternity in the Constitution: A Review” on July 16, 2016 at Nehru House, Jamia Millia Islamia in association with the Democratic People’s Lawyer Association (DPLA), Citizens For Democracy (CFD) and the All India Milli Council (AIMC). Introducing the theme, Prof. M. Afzal Wani, Professor, school of Law & Legal Studies, G. G. Singh Indraprastha University and Asstt. Secretary General, IOS stressed that it was fraternity that was cardinal for integrating humanity. It strengthened the belief that all human beings belonged to the same earliest parents. In the absence of basic traits of humanism, human vision got narrower. If that happened, man would destroy everything before being destroyed himself. Referring to the Quranic teachings, “Best among you is one who performs best” he said that this was also applicable to our Constitution which set for itself the goal of fraternity. Violation of the Constitution meant violation of humanity. Noting that the Prophet (pbuh) established norms of humanity, he maintained that global humanity was possible only by promoting fraternity. Vice-Chancellor, Indira Gandhi National Open University, Prof. M. Aslam, lamented that even after more than six decades of the adoption of the Constitution, we were still discussing its finer points. 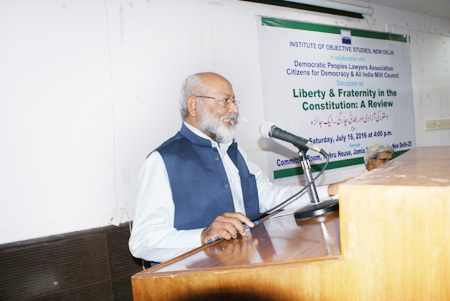 We failed to educate people about liberty and fraternity that were the corner-stone of our Constitution. It would have been better if students were also taught about the basic features of the Constitution. Commenting on the situation obtaining in the country, he laid emphasis on the need for inter-community dialogue between Muslims, Christians and among other minorities. He also suggested inter-community dialogue between Muslims and the majority community in order to reach a consensus on broader issues confronting the nation. Calling for starting the process of dialogue without loss of time, he said that reconciliation, not confrontation was the need of the hour. Giving a wakeup call, he said that we must act before it was too late. He also stressed the need for legal literacy at the grassroots level for better understanding of law and the Constitution. Eminent journalist and human rights activist, John Dayal assailed the new education policy which he said was laced with saffron colour. He objected to the use of rites according to the customs of a particular religion at foundation-laying on government’s inaugural functions. In this connection, he cited the function held at Amravati to lay the foundation for the new Capital of Andhra Pradesh where Sanskrit hymns were chanted in complete disregard of the secular character of the state. Similarly, Shri Vedic shlokas were chanted at a ceremony organised to mark the induction of the indigenously-built Tejas fighter plane into the Indian Air Force. He said that there was a bagful of contradictions in the Directive Principles of State Policy in the Indian Constitution. While ban on cow slaughter was being vigorously pursued, other finer points in it did not attract the attention of the protagonists. He accused the Central government of squeezing out the non-governmental organisation (NGOs) by arbitrarily using provisions of Foreign Contributions Regulation Act (FCRA). This had forced several of them to close down or sell out. He disfavoured ban on communal organisations, like RSS and the Vishwa Hindu Parishad (VHP), asking for putting restrictions on their leaders in order to circumvent them from vitiating the atmosphere of peace and harmony. He said he would drag them into a court of law if they incited people to violence. Founder Director of the Institute of Peace and Harmony, MD Thomas held that we were part of a process that was on for the betterment of society. Quoting Dr Ambedkar he said, “If we live by the Constitution, it is good and if we do not live by it, it is bad.” He explained that the core of our existence was freedom and it was fraternity that had integrated us with the rest. We claimed to be a religious country but if we violated fraternity, we would be violating the Constitution. Thus as concerned citizens we cherish certain values which enjoin upon us a duty to love our countrymen irrespective of their gender, caste and creed. Calling for the evolution of national solidarity, he said that we must put our mind and concern together. 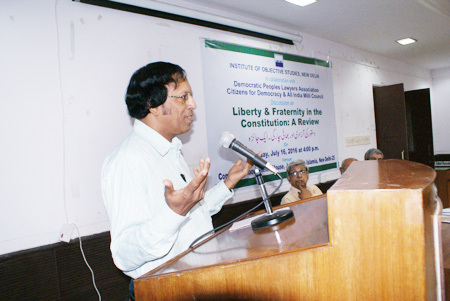 Chairman, Democratic People’s Lawyer Association, Arun Kumar Majhi, advocate, opined that the Indian Constitution was based on lofty ideals, but the ruling class had taken all the three branches of government in its control. He cautioned that liberty and fraternity were in jeopardy due to their usurpation by the ruling class. He held the Brahminical order responsible for destroying the liberty of Muslims and Dalits. He brought home his point by saying that Muslims and Dalits constituted 90 percent of jail inmates in the country who were languishing in jails for years together for want of access to legal aid. The Chancellor of Bharti Shree Peitham, New Delhi, Swami Sarvanand Saraswati, held that religion never came in the way of the promotion of humanity. He said that the one who promoted humanity and human values was dear to God. He called upon the people to rise above caste and creed and strengthen humanity. 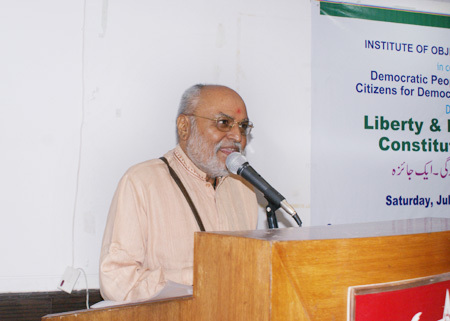 Secretary General, Citizens for Democracy, Dr. ND Pancholi, said that we had to go deep into history in order to understand the true meaning of liberty and fraternity. Man had struggled hard to attain freedom. Thus freedom was of utmost value. He said that obstacles to liberty, freedom and fraternity were placed by bringing in harsh laws like TADA, POTA and UAPA. He stressed the need for awakening the people against the curbs on freedom and for building up a campaign against UAPA. In his presidential remarks, the Chairman of the IOS, Dr M. Manzoor Alam, exhorted the youth to come up and define their role in the present context. He quoted a line from the famous poem of Dr Iqbal, Mashriq-o-maghrib mein teray daur ka aaghaz hai (this is the beginning of your time from east to west). He said that we had been debating Fundamental Rights under the Indian Constitution for the last 65 years and this debate would last till the Constitution lasted. Echoing views of Prof. Aslam, he said that the All India Milli Council had already been organising such inter-community dialogues. He held that the course would be further pursued. 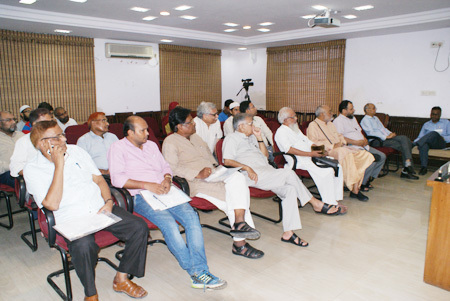 In order to take the course of inter-community dialogue forward, he informed, a two-day function in this connection would be organised in Gaya (Bihar) on September 24 and 25, 2016 in collaboration with the Magadh University, Bodhgaya. Gaya had been advisedly selected as the venue of the meet on religious understanding because of its significance as one of the most important seats of Buddhism, he said. He was at pains to explain that a hate campaign in the form of Islamophobia was being spread through the width and length of the world. This misinformation campaign could be put to an end by concerted efforts of enlightened people of the communities other than Muslims. He complained that on hearsay Muslims were judged and no action was initiated against those who openly promoted hatred and ill-will against a particular community. Though the recorded statements of such leaders had gone viral, no action against them was forthcoming. He said that the law meant for the protection of Muslims and Dalits seemed to have become null and void. He urged intellectuals of all hues to sit, think and work together. This meeting reaffirms the right to liberty of thought, expression, belief, faith and worship as guaranteed in the Constitution. The said freedoms can only be guaranteed on the basis of non-violence. 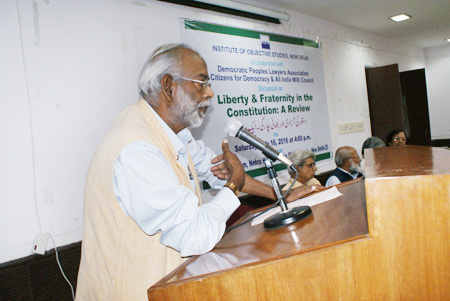 The concept of liberty is directly connected to democracy as observed by one of the fathers of the Indian Constitution, Acharya J B Kripalani. These minimal rights are to be enjoyed by every person for free and civilised existence in society. This meeting asserts that the right to liberty and personal freedom is an important fundamental right given by the Constitution of India under the articles 19, 20, 21 and 22 and is a tool for ensuring a democratic framework. The term “fraternity” added to the Preamble of the Constitution, is in the spirit of brotherhood with the feeling that all people are children of the same soil, and is the cementing factor of the inherent diversities, and is not possible unless the dignity of each individual is preserved and mutually respected. 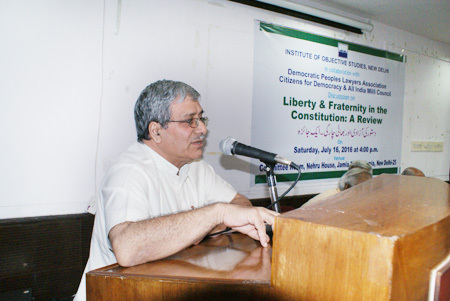 This meeting strongly feels that any proposed steps to deprive the educational institutions established by the minority communities, as per the provisions of the Constitution, of the right of governing and running with minority character, are denial of the basic rights of the minorities, hence of fundamental rights. It also sees the efforts to raise the demand for a uniform civil code interference in the personal laws of different communities. Democracy, fraternity, liberty can flourish only in an environment of equality, mutual respect and respect of the rule of law. Speech, words, writings and abuse of social and audio-visual media that incites violence and divisiveness, hate and targeting of communities, must invite action under the law. Earlier, a verse from the Holy Quran was recited by Hafiz Athar Husain Nadvi with translation in Urdu to mark the opening of the meet. 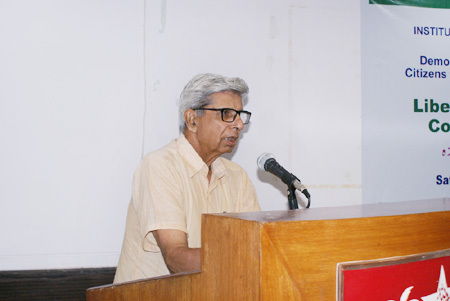 In his welcome address, Prof. Eqbal Husain, Deptt. 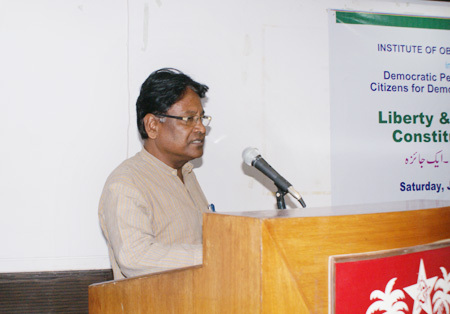 of Law, JMI cautioned against the lurking danger of fascism to society. The meet was attended by a good number of social activists, academics, researchers and prominent citizens.